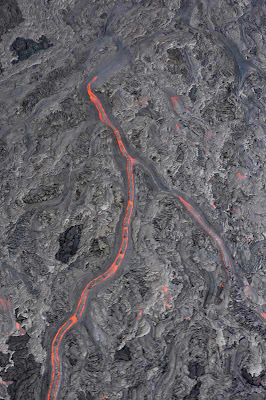 Not since New Years Eve has surface lava been active on the Pulama Pali. 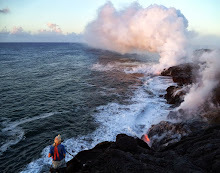 It is now only four miles west-northwest of Kalapana Gardens community, and can be seen after dark from that area. 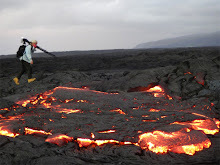 Surface flows have been slowly spreading and inflating southeasterly between Pu`u O`o crater and the Big Island’s coastline. 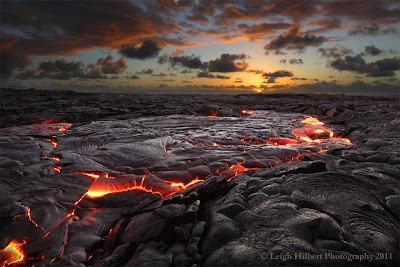 These surface flows, which are mostly pahoehoe, are still nearly three miles from the sea, with the leading flow front located just above the mostly devastated and abandoned Royal Gardens subdivision. This front is moving across, and basically parallel to, and just east of, the last big lava surge we had come through the area last December. At this time, the active surface lava is not endangering any forests or homes. 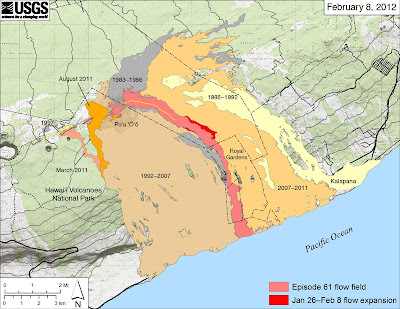 Magma pressures within the Kilauea pluming system will likely determine when or if this flow front will advance further down the pali towards the sea. I may go take a close look at this in the days ahead and report back here. 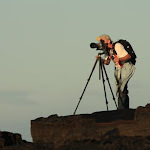 As always, the US Geological Survey (USGS) / Hawaiian Volcano Observatory (HVO) are doing excellent coverage of all eruptive activity around the two craters and surface flows. 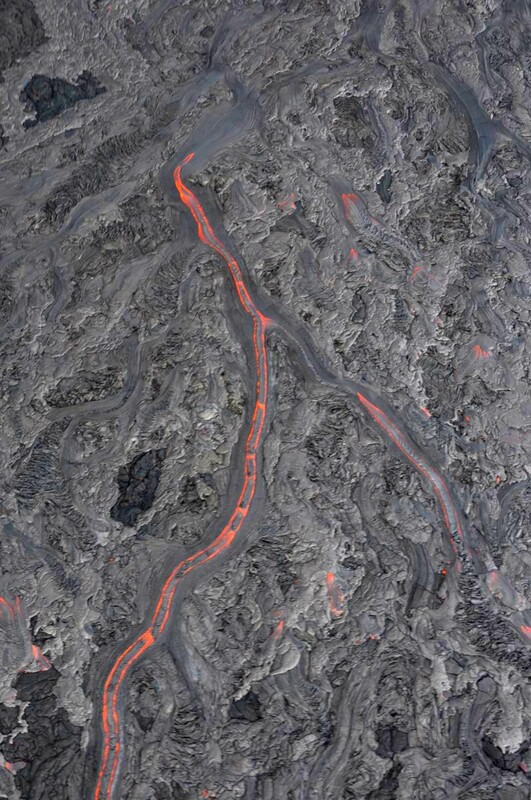 This HVO field webcam currently shows the main area of surface lava; this is especially evident after dark if there are no rain showers. (Once the link opens you can click on it for a larger view size). First off— I am so appreciative to those of you who have so kindly donated your funds towards the completion of my feature lava movie! 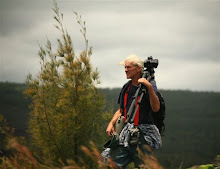 You will all receive signed final versions of the movie on DVD and be listed as sponsors within the movie credits. With those funds I am now arranging to hire a professional co-editor to help fine-comb my rough (but very cool) first drafts, and to add any special affects that may enhance it. I am holding off on bringing in the co-editor a little bit more as I do some important tweaks to the draft and share that with a few friends at a screening here in my home tomorrow night. This will be my third showing of the movie drafts in the past month and the feedback is important; it let’s me know the strengths and weaknesses of the story and footage. This movie is looking sooo good now! (the screeners get excited to come back and see it again - a good sign I think :) It currently has a running time of 45-minutes, which I hope to keep it close to through the editing ahead.